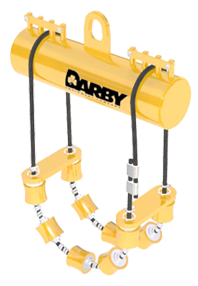 Darby PRC06-12 has 10 rollers to more evenly distribute the load, some competitors use 8. Multiple urethane rollers spaced to support the pipe evenly and to prevent "egging." 4 1/2" Rollers have grease fittings to increase longevity. Pipe Size Range 6" - 12"